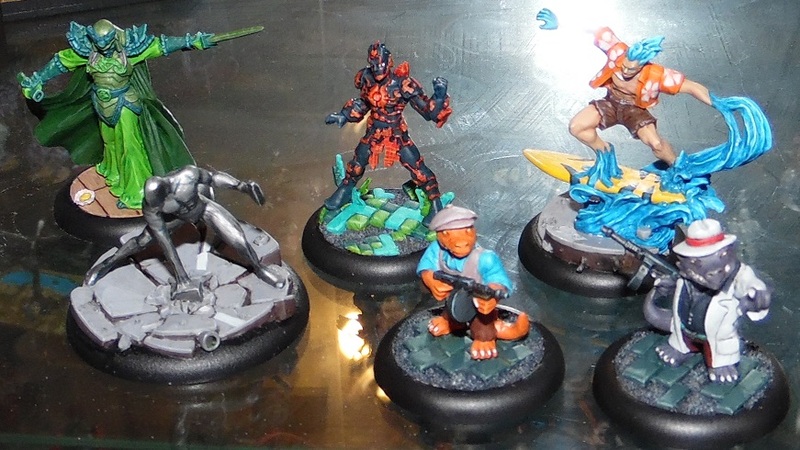 Hephesto's Forge: 2015 - XIII - Some finished Supremes and planning ahead for the rest of the year. 2015 - XIII - Some finished Supremes and planning ahead for the rest of the year. Time for another hobby update. 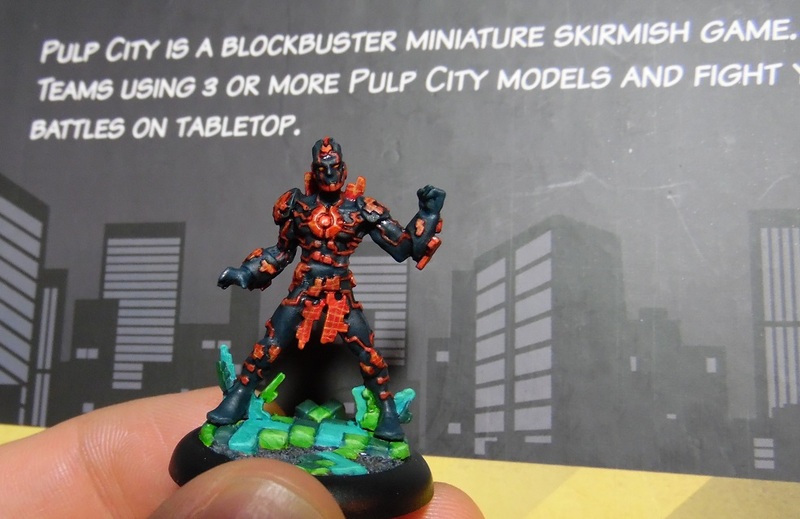 Slow as progress might be, there's some actual, finished Pulp City models to show off again! 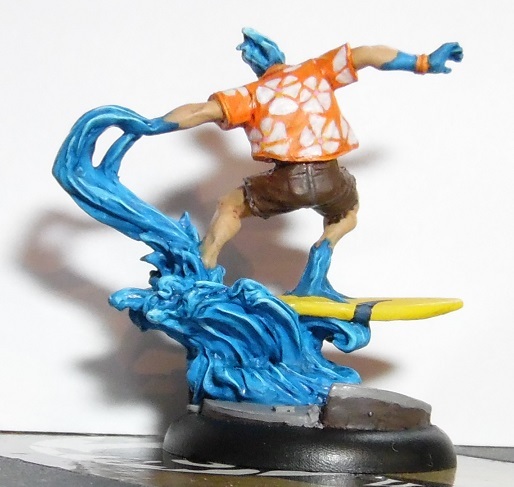 First up we have the awesome Vector sculpt, who is essentially a hacker turned into a half-demented, living virus. Very fiddly model to paint up, though that's most likely down to my own choice of colors, highlight approach and the extra detailing on the larger panels of his costume. 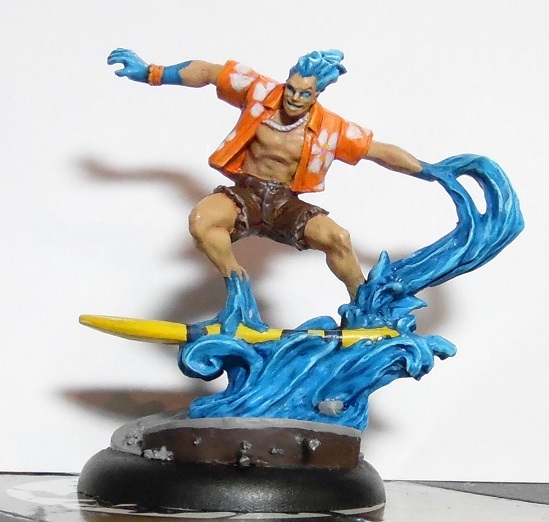 The base was also a lot of fun to sculpt and paint, for this guy it also really helps to build his 'story'. 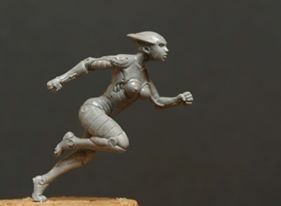 There is a lot of basing work potential with most of the Pulp City range, but a lot of it comes do to getting the most out a sculpt's pose or enhancing a feeling of movement. There are some models in there where the base can really help creating more of a unique setting and story for the model, Vector as well as the Emperor are great examples of this. Speaking of using extra base work to get the most out of a model's pose, Dr. Mercury definitely fits into that category. 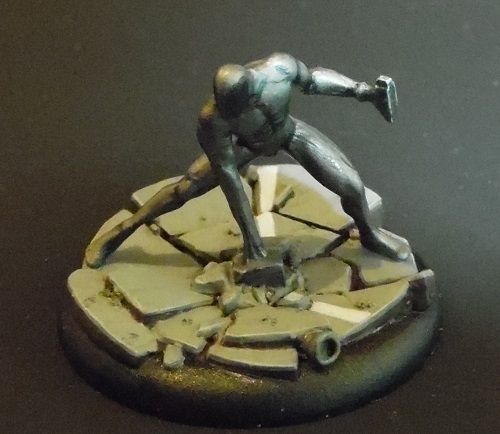 His ground pound just begs for the extra mile and though all that putty and plasticard work was a bit of a hassle to build up it was well worth it in the end. Painting wise the model was also quite interesting, though very tough to take a decent picture of. Pretty much all the shadow work is actually painted on there, starting from a blue metallic base that you can just still barely make out when he's on the table. The shadow work doesn't really stand out all that much in pictures, but it really makes him look very dramatic in regular daylight, creating a bit of a liquid metal look. Certain Supremes in Pulp City give you points you get to use buying support minions, now some of these are the types of models you'd expect in a game like this like cyborgs, ninjas and vigilantes. But then there's the weirder stuff like walking, half cybernetic piranhas, flying cats with miniguns and mutant, dinosaur mobsters. Just look at these guys, their both cute and intimidating! Also helps that the official studio scheme was especially inspirational. Now I won't reach that level any day soon, but having such a nice, clear example of a very effective color scheme does wonders in staying focused on these little guys. Here's to hoping we'll see more awesome minions like this in the future. 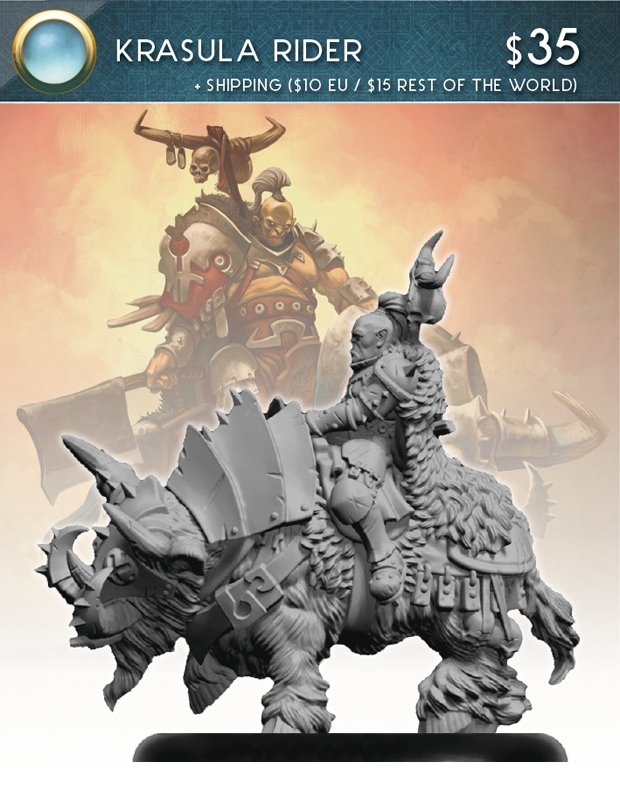 Fingers crossed for a triceratops mob boss! The rulebook definitely has quite a few cool pieces of artwork left that will hopefully be turned into real models in the future. 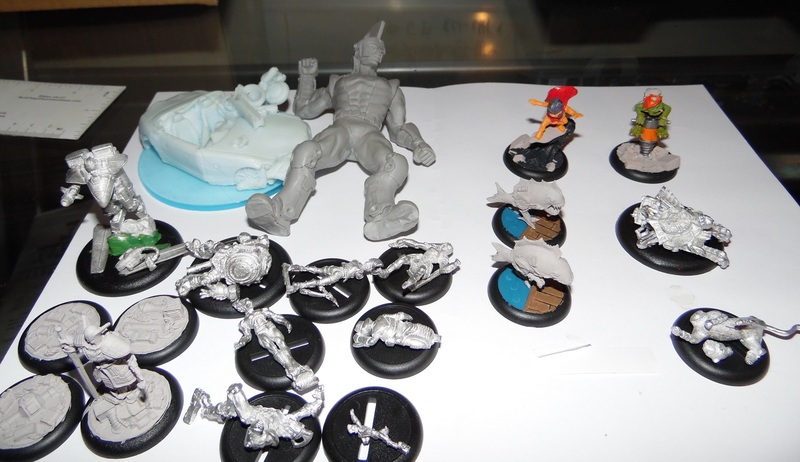 Minis like a raptor ninja, artillery emperor penguin, robotic voodoo dolls, acrylic pixel minions for Vector, walking brain jars etc. Heck the same goes for actual supreme models, there's a lot of awesome designs hidden in the rulebook. And finally, and another one of my favorite, smaller characters from Pulp City, Seabolt. Now there's a lot of big, big personalities and characters stomping around in Pulp City, both when it comes to planning genius and absolute destructive power. Seabolt is a bit of a smaller fry and much more of an evil daredevil. He'll be robbing a bank in order to throw a party, not to build some kind of doomsday device. I feel his personality really shows in the dynamic sculpt, he's clearly enjoying himself (probably at the expense of some unlucky Pulp City civilians). Rather felt I went overboard on the Hawaii shirt, especially when it comes to the size of the floral motive. But once everything dried it's started to grow on me, it has that 80's, Magnum, Tom Selleck-esque gaudiness to it that rather fits with the Seabolt's personality. 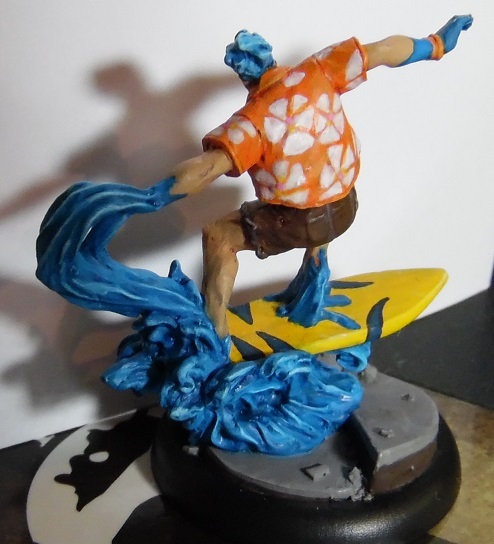 Also slightly extended the water using some putty to balance the wave effect on top of a custom, ruined urban base. 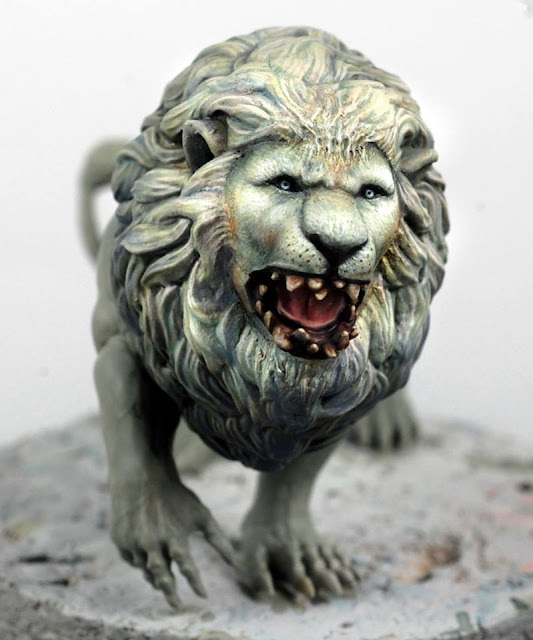 Looks particularly cool on an urban table and when facing off against Dr. Mercury. So not entirely happy with all the individual elements of the model, but as a whole he looks great on the tabletop. Finally I'm slowly starting to plan out minis and projects for the rest of the year, all in the hopes of ending the year with a bit of a sprint. Plan to build the entire Heavy Metal faction for my Pulp City collection. Time permitting I hope to get some of these painted up as well, but I'll already be happy to get them build and undercoated for a January project. Captain Hadron in particular is going to be quite an interesting Heavy Metal challenge, as he comes in normal 28mm scale, as well as a mini and large version. 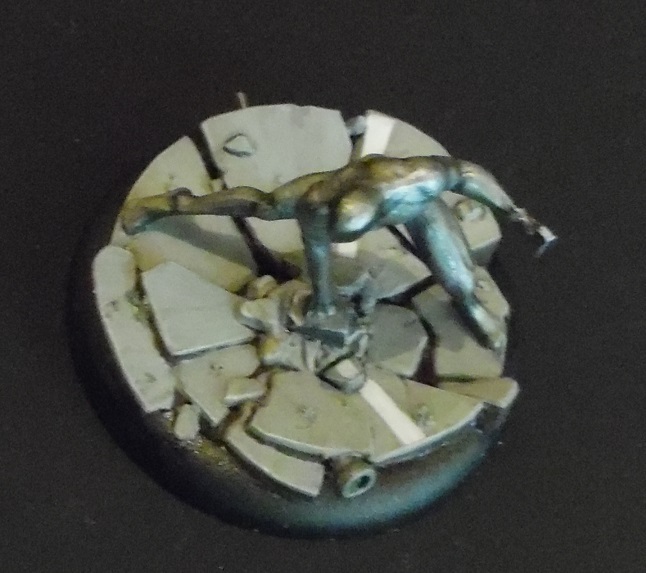 Luckily I have a resin wrecked car around from Antinociti's Workshop that should do wonders to make that huge 80mm base a little bit more special. 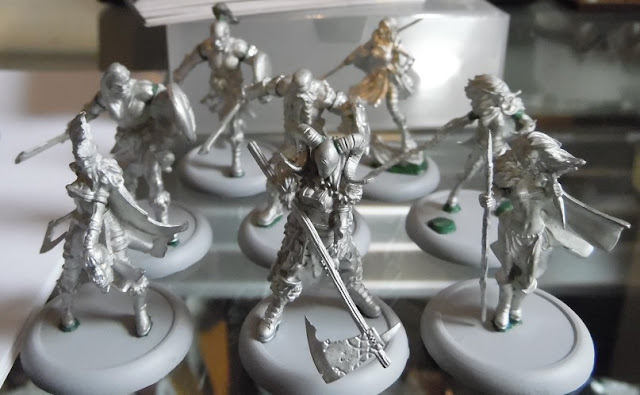 Then there's the a Norsgard warband, starting off with the Howling Horde models. 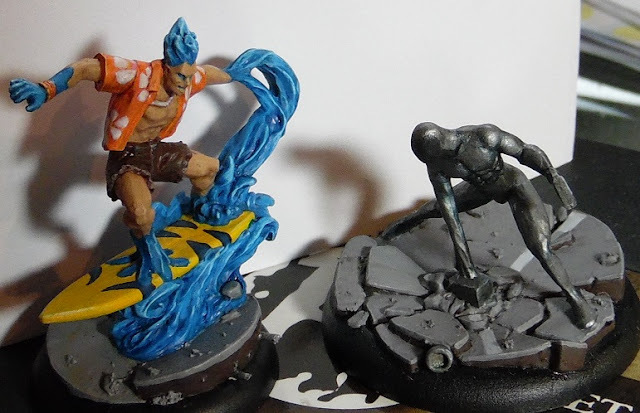 Haven't painted any 'normal' human, fantasy models in ages, which combined with the winter-theme of the game should make for a nice change of pace. 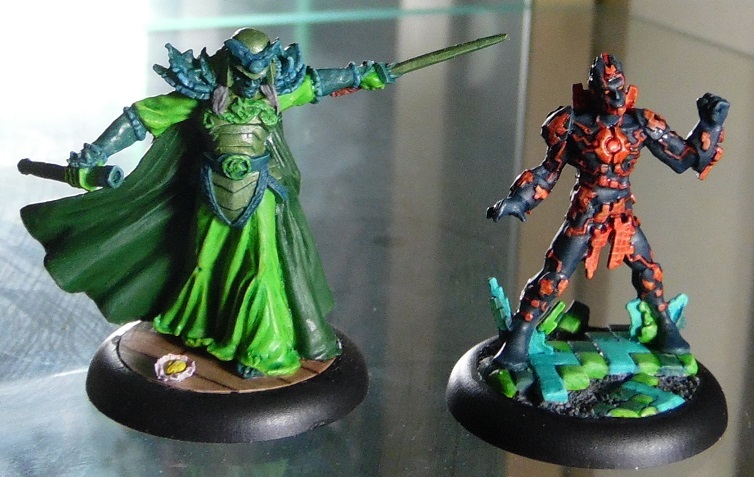 Been painting a lot of bright stuff lately, which has been quite a relief after all those years of grimdark. Still it's also a lot of fun to go back to some darker, more earth / gray toned color schemes for a small selection of models like this. The second Norsgard Kickstarter is also in its final hours and there's some really cool stuff to check out. 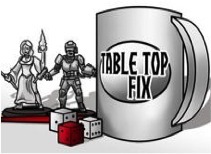 For those interested head over to Kickstarter to help out the game HERE. 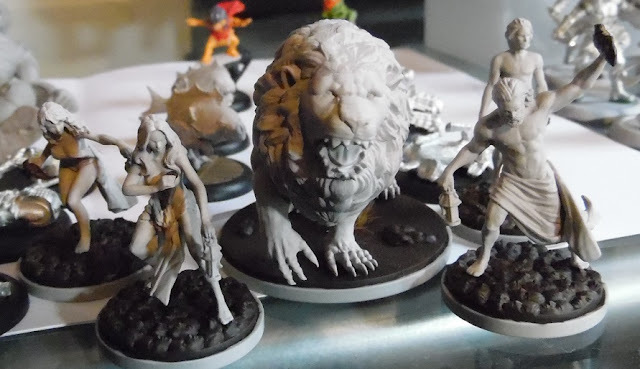 In between the Howling Horde models and regular skin tones for the Heavy Metal and general Pulp City models I should also pick up enough little hints and tips to get the Kingdom Death Monster starter minis painted between the holidays. 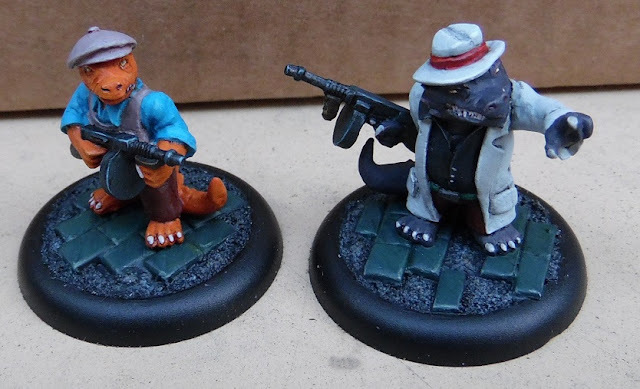 The plan is to get an actual campaign going end of the year, or early January and having these painted should do wonders to keep the group focused on the game. 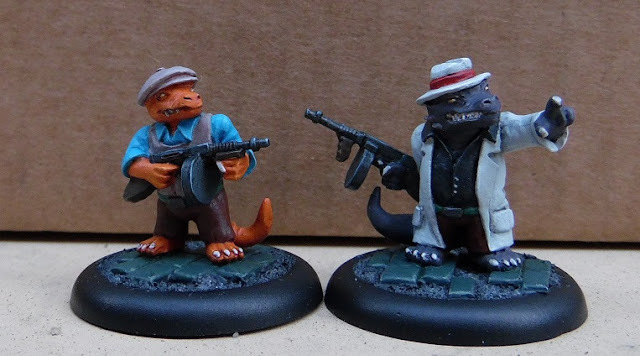 And that does it for this update, should be back next weekend with some more Pulp City goodies in the form of two Grimm Underempire models and maybe even the Ancklebiter minions. With some luck I'll also get around to another Look at article, this time for the newest Afterlife releases from Anvil Industry. Have a good one everybody! Unfortunately, the interface is a little clumsy to use–you must navigate to Advanced Settings in order to logout, for instance, and on iOS, the actual video call screen is just a black background with chat windows (it’s better on PC).